A videogaming boy, seemingly doomed to stay at his trailer park home all his life, finds himself recruited as a gunner for an alien defense force. This movie is about Alex Rogan, a young kid who dreams about leaving his trailer park home and travel to far away places. He spends his time helping people around the park, and playing the lone arcade game in the trailer park, 'Starfighter'. One day, he plays a particularly successful game, which results in the whole trailer park being crazy with excitement about his achievement. 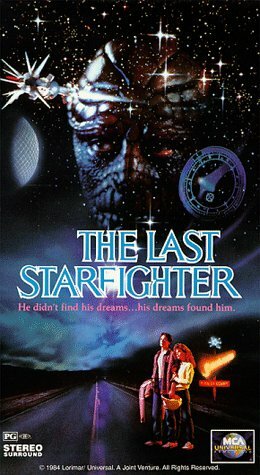 The Last Starfighter is supposed to represent the dreams of arcade game-playing kids of the 80's. A problem that this type of movie can suffer from is that movie directors and writers that were active during the 80's often would have grown up in the 50's, when 'Computer Space' wasn't even a glint in the eye of Nolan Bushnell. This tends to happen a lot when movies are made 'for the kids' by movie makers who are normally over 40. A great example being the awful (yet strangely endearing) thinly veiled Nintendo commercial 'The Wizard'. The director of The Last Starfighter, Nick Castle, also co-wrote the cool 'Escape from New York' with John Carpenter, a movie that shares a feature with The Last Starfighter: annoying 50's-style overcharismatic overacting supporting actors. Escape from New York features Ernest Borgnine as the cab driver, appropriately named Cabbie, and The Last Starfighter features Robert Preston as the completely unconvincing alien, Centauri. The movie features a few alien creature effects, but nothing particularly convincing. However, it is one of the earliest examples of heavy use of CGI special effects - Tron being one of its predecessors. The effects work quite well in space battle sequences: spaceshipe are poorly animated, but the models are created with great detail, and the illusion works well enough. The main weakness of The Last Starfighter, however, is the general writing and acting (which some may consider important for a movie :). The alien characters are ill-defined and seem out of place, and the sci-fi parts of the plot seems incredibly incoherent. Lance Guest is poor as the unwilling hero Alex Rogan, he delivers lines with awkward timing and weird facial expressions; his performance reminds a bit of Hayden Christensen in Star Wars: Episode II and III. However, there are a few genuinely funny moments when he plays Beta Alex, a robotic clone of Alex Rogan that has trouble grasping the daily human life - particularly the part where he has a girlfriend. All in all, The Last Starfighter does not really tap into my 80s arcade game nostalgia the way it should, and compared to the similarly-themed Tron, this is a more naive and poorly executed sci-fi movie.